This solution extends ConceptDraw PROJECT and ConceptDraw MINDMAP software with the ability to import and export project data. Import MS Project .mpp files with ConceptDraw PROJECT. Import and export MS Project XML files with ConceptDraw MINDMAP Import and export Mindjet MindManager files with ConceptDraw PROJECT and ConceptDraw MINDMAP. To get started you will need ConceptDraw PROJECT, ConceptDraw MINDMAP and the solution PROJECT EXCHANGE. You can find the solution in the Collaboration Area of ConceptDraw Solution Park. Make sure that you install it on your computer. Download and install ConceptDraw PROJECT, ConceptDraw MINDMAP and ConceptDraw Solution Browser. Install the “PROJECT EXCHANGE” solution using Solution Browser. Use MS Project Input plug-in (File -> Import -> MS Project) to convert data to ConceptDraw PROJECT format. Now you can enjoy all benefits of INGYRE3 technology; generate dynamic visual reports, diagrams and dashboards. In ConceptDraw PROJECT use MS Project Output plug-in (File -> Export -> MS Project) to convert data to MS Project format. Now you are able to share your project data with MS Project users. Save your MS Project document (*.mpp) to MS Project XML. Use MS Project XML Input plug-in (File -> Import -> MS Project XML) to convert data to ConceptDraw MINDMAP format. In ConceptDraw MINDMAP use MS Project XML Output plug-in (File -> Export -> MS Project XML) to convert data to MS Project XML format. Use Mindjet MindManager Input plug-in (File -> Import -> Mindjet MindManager) to convert data to ConceptDraw PROJECT format. Use Mindjet MindManager Input plug-in (File -> Import -> Mindjet MindManager) to convert data to ConceptDraw MINDMAP format. In ConceptDraw MINDMAP use Mindjet MindManager Output plug-in (File -> Output -> Mindjet MindManager) to convert data to a Mindjet MindManager format. In ConceptDraw PROJECT use Mindjet MindManager Output plug-in (File -> Output -> Mindjet MindManager) to convert data to a Mindjet MindManager format. Now you can share your project data with Mindjet MindManager users. Benefits: Increasing flexibility on how to exchange project information with all members of the project team. The exchange of project data across different project applications helps to keep everyone informed and allows quality collaboration among team members, as well as external 3rd parties who have project involvement. Objective: Provide a tool for data exchange between ConceptDraw PROJECT, ConceptDraw MINDMAP, Mindjet MindManager and MS Project users. Solution Purpose: Help to exchange project data across different project and mindmapping applications. Intended For: Solution is intended for managers and teams who use ConceptDraw Products, alongside MS Project and Mindjet MindManager. Convert MS Project files to ConceptDraw format. Convert ConceptDraw data to MS Project format. Convert Mindjet MindManager files to ConceptDraw format. Convert ConceptDraw data to Mindjet MindManager format. The PROJECT EXCHANGE Solution offers users of ConceptDraw PROJECT, ConceptDraw MINDMAP, Mindjet MindManager and MS Project to exchange project data. The solution module is implemented as a plug-in which work with MS Project and Mindjet MindManager file formats. ConceptDraw PROJECT and ConceptDraw MINDMAP have the ability to save to MS Project file format so that ConceptDraw PROJECT and ConceptDraw MINDMAP files can be shared with users of MS Project (2007, 2010, 2013, 2016 and 2019) as well as any other project management tools that can accurately import the MS Project file format. ConceptDraw PROJECT and ConceptDraw MINDMAP have the ability to save to Mindjet MindManager file format so that ConceptDraw PROJECT and ConceptDraw MINDMAP files can be shared with users of Mindjet MindManager. The PROJECT EXCHANGE Solution converts ConceptDraw PROJECT files (*.cdpz) to MS Project files and back. This solution works for MS Project 2007, 2010, 2013, 2016 and 2019. The PROJECT EXCHANGE Solution allows users of ConceptDraw PROJECT to generate project content that can be shared with all team members. ConceptDraw PROJECT — project planning and management software. Read more about ConceptDraw PROJECT. ConceptDraw MINDMAP — brainstorming and mindmapping software. Read more about ConceptDraw MINDMAP . 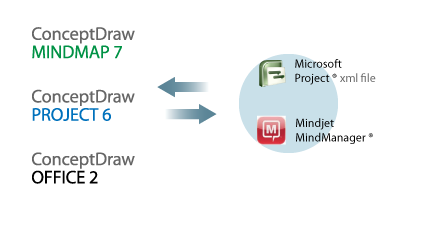 ConceptDraw MINDMAP and ConceptDraw PROJECT have the ability to import and export Microsoft Project MPP and XML files. Because of this ability to exchange data between ConceptDraw and MS Project; users now have increased flexibility on how to exchange project information with all members of the project team. The exchange of project data across different project applications helps to keep everyone informed and allows quality collaboration among team members, as well as external 3rd parties who have project involvement. accomplishment ×productivity=success. Productivity is all about having the right tools for the right job. Tools that lend themselves too many situations because of their flexibility. Tools that make communication of status easier with your work peers. Tools that accurately report your progress and the achievability of the end goal. ConceptDraw products deliver on this promise to our customers. The individual ConceptDraw products (ConceptDraw MINDMAP, ConceptDraw PROJECT, ConceptDraw DIAGRAM, and ConceptDraw STORE) provide many automated integration points because of CS Odessa’s INGYRE technology. INGYRE provides tight data integration between the individual ConceptDraw products to optimize workflow and increase productivity. Tight integration between the ConceptDraw products is great for homogeneous environments, but not everyone has everything the same in the workplace. Most workplaces have a mix of technologies, applications and operating systems. Sometimes differences in operating systems require users to take extraordinary measures just to share information. ConceptDraw products are a great linchpin solution that ties your team together. Have some of your team on PCs and others are on Macs; ConceptDraw solves the issue of sharing project data among all team members. Have some of team members using Microsoft Project® and others are not? ConceptDraw again solves the issue at a very low price point. 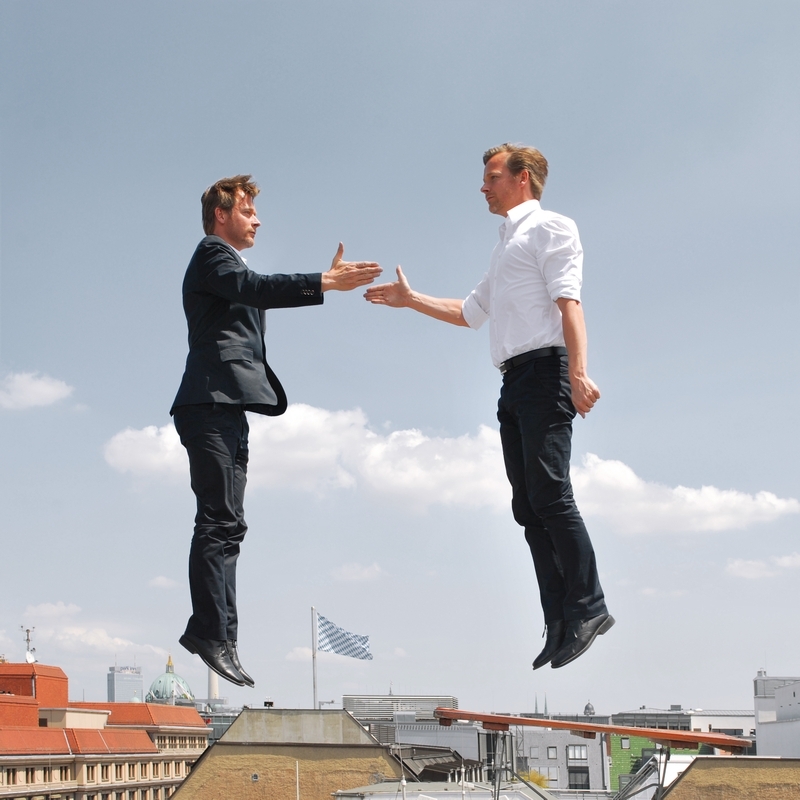 Have some team members using Mindjet® MindManager® and others are not? ConceptDraw once again solves the issue, by being able to provide for the two way exchange of data between different file formats. Figure 1. ConceptDraw products are unparalleled in their ability to share information with other applications, as well as work with mixed computing platforms (mac and PC). Because the individual ConceptDraw products are so flexible, it is possible to outfit your team with exactly what is needed at an economical price point. If you have team members who need only mind mapping, or only project management, or only business diagramming; ConceptDraw is an excellent choice. Have other members of your team that need the ability to pull projects rapidly together and get them off the ground; then manage all aspects of them, as well as generate project scoreboards and Work Breakdown Structures? ConceptDraw is again the answer to the situation. The power to mix and match applications, work on PCs and Macs, cooperate with other applications in your environment, and provide high-customer value, makes ConceptDraw products the choice in many organizations around the world. ConceptDraw provides a total solution for you and your team. The ability to exchange project information is key to a project’s success. ConceptDraw MINDMAP and ConceptDraw PROJECT have the ability to save to a MS Project MPP and XML file format so that ConceptDraw files can be shared with users of MS Project (2007, 2010, 2013, 2016 and 2019) as well as any other project management tools that can accurately import the MS Project XML file format. This allows users of ConceptDraw MINDMAP, ConceptDraw PROJECT and ConceptDraw OFFICE (contains ConceptDraw MINDMAP and ConceptDraw PROJECT) to generate project content that can be shared with all team members. Project participants also have the ability to import MS Project files into ConceptDraw MINDMAP, ConceptDraw PROJECT and ConceptDraw OFFICE. This gives users an excellent alternative on the way they manage projects, and assists in the interoperability of project information between team members who have Macintosh and PC computers. Being able to exchange data between ConceptDraw OFFICE and MS Project is a big plus for project members because they can then use the other project tools that are part of ConceptDraw OFFICE. As an example, ConceptDraw MINDMAP, part of ConceptDraw OFFICE, can be used as a project front- end to brainstorm, build processes, identify contingencies and organize information for presentations to brief team members and stakeholders. ConceptDraw MINDMAP also has the ability to import and export Mindjet MindManager file format, giving users additional flexibility in working with others. ConceptDraw MINDMAP has the flexibility required by project teams to get things accomplished. ConceptDraw MINDMAP is a versatile easy to use desktop tool that manages single or multiple projects in a single mind map. ConceptDraw MINDMAP has extensive importing and exporting capabilities to minimize communication issues between project teams. ConceptDraw MINDMAP either on a PC or a Mac has the ability to import and export Microsoft Project XML files as well as improved import and export capabilities of MindManager files. The powerful connectivity capability of ConceptDraw MINDMAP makes it critical tool to align teams and resources. ConceptDraw MINDMAP also contains many powerful reporting outputs that keep team members up to date on changing conditions. ConceptDraw PROJECT is a powerful easy to use desktop tool that manages single or multiple projects, as well as the associated resources that are assigned to those projects. ConceptDraw PROJECT has extensive importing and exporting capabilities to minimize communication issues between project teams. ConceptDraw PROJECT with its extensive reporting capabilities keeps project managers and all team members up to date on changes that occur during a project’s lifecycle. The ability to import and export MS Project files are a powerful productivity attribute for ConceptDraw PROJECT extending the power and usefulness of this industry tested project performer. ConceptDraw Office is a powerful business suite of software tools that are well adapted to project management and project tasks. Included in ConceptDraw Office is ConceptDraw MINDMAP, ConceptDraw PROJECT and ConceptDraw DIAGRAM ConceptDraw MINDMAP allows you to brainstorm, run project meetings, gather requirements, build processes and start designing the structure of your projects. ConceptDraw PROJECT is a great project management tool that is powerful enough to function as the nerve center of any type of project you need to manage. ConceptDraw DIAGRAM provides extensive rendering tools that will draw Work Breakdown Structures, PERT Charts, up-to-date project scorecards, timelines, organizational charts, and many other needed business diagrams. ConceptDraw OFFICE makes it easy to import from and export to MS Project, providing a level of power and flexibility that never existed for project teams before. CS Odessa provides a range of professional project software tools that assist you during every stage of your project. ConceptDraw Office uses powerful ConceptDraw INGYRE technology to make all tasks as easy as pushing a few buttons. The top to bottom integration of ConceptDraw OFFICE, which includes the innovative standalone products ConceptDraw MINDMAP and ConceptDraw PROJECT product, are valuable tools to help Project Managers work towards their organization’s success. In addition to the powerful project management solutions built into ConceptDraw products, CS Odessa also provides many project management solution add-ins that can be downloaded from ConceptDraw Solution Park. The combination of ConceptDraw Products and ConceptDraw Solution Park, from CS Odessa makes for an unbeatable value in project management software tools.